UPDATED 12/8/2015 3:15 p.m. Dacra, the company spearheading development in Miami’s Design District, just sold an assembly of commercial buildings in Wynwood for $5 million. 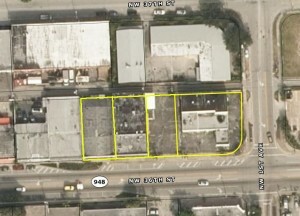 The sale includes four connected properties at 135, 119, 109 and 101 Northwest 36th Street, according to Miami-Dade County records. Together, they make up about 0.55 acres of land less than a mile away from the booming Midtown district. The buyer is SET 36th Street LLC, which is managed by tax consultants who specialize in facilitating 1031 exchanges. A 1031 exchange is a piece of the IRS code that allows investors to avoid capital gains taxes by selling a property and purchasing another similar property with the money. The portfolio is made up of two low-rise warehouses at 135 and 119 Northwest 36th Street, a connected lot that’s used as surface parking, and a third warehouse that’s zoned as an auto repair shop at 101 Northwest 36th Street. Thirty-Sixth Street Associates, a Miami company that shares the same address of Dacra, paid $375,000 for the properties in 1999. That breaks down to about $15 per square foot of land. Now, the company has sold its assembly for $206 per square foot, or 13 times what it last traded for 16 years ago. Alfredo Riascos of Metro 1 brokered the deal on behalf of the buyer. He said Dacra represented itself for the sale, which was done off-market. The buyer, whom he declined to name, is a domestic investor with holdings both in Miami and throughout the United States. Riascos said his client will use the buildings as storage space for right now, as he’s still considering his long-term options. Dacra, headed by president Craig Robins, has been the lead developer for Miami’s burgeoning Design District. The neighborhood is already a haven for luxury retail, and Robins’ planned third phase includes ritzy residential buildings, restaurants and a boutique hotel. Dacra could not immediately be reached for comment.